Murals on college campuses can be weird and creepy. When I visited University of Wisconsin, Madison a few years ago, I discovered one of them right in the midst of the student union. From all other appearances, the union is wonderful. It overlooks a large wooded lake, and there’s what looks to be a beer hall where students can weather the cold winters in contentment. But when I went there, I found one room of the complex featuring twin murals facing each other. They depicted landscapes and struggles, rich with a diversity of people, men and women of all races. The controversial element of the mural is somewhat obscured in this official UW Madison photograph. What did I do when I saw this? Something I do whenever confronted with a work of this nature: I performed a white man check (disclosure: I am not a white man). On one of the murals, the only two figures who appeared more than likely to be white men happened to each have a noose around their neck. Perhaps they were martyrs for some good cause. But I suspect the mural might have run into resistance if the noose had been around any minority status necks. Really, does the heart of a Federally subsidized land grant university need to be so edgy? Back on the Left Coast, the University of California, Davis, has its own diversity mural on the wall of its Memorial Union. It depicts people, artifacts, and architecture from diverse cultures. Performing the white man check on it reveals a forlorn-looking marble bust from Western antiquity, sulking in the far corner, while a colorfully painted Mesoamerican leads the rest of the world in a rollicking two-dimensional block party. Unrealistic expectations aside, campus murals are often unsuitable to universities, inasmuch as they are supposed to adorn places safe for open intellectual inquiry. 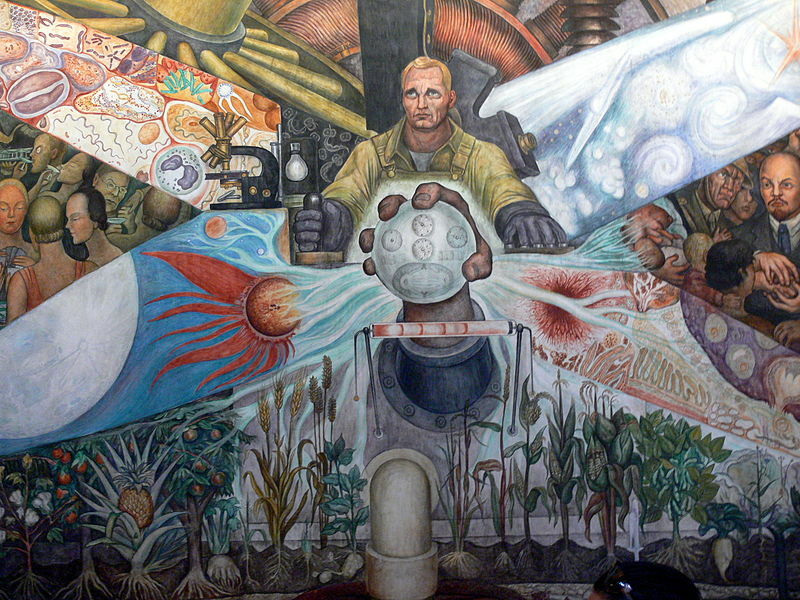 El muralismo, the Mexican school of murals developed by Diego Rivera and others in the 1920s, inevitably incorporates themes of popular revolution and uprising. Thick, sturdy figures populate brown-washed scenes of agrarian landscapes alternating with molten-lit caverns industrial might. The imagery recalls the regrettable chapter of global history when national governments promised utopias by pursuing various forms of totalitarianism. It’s incredible that significant parts of academic culture, so wary of fixed truth, would readily employ a format devised as unabashed propaganda. Large and imposing, murals tend to bully a public space. One will think twice before reading Thomas Sowell or mentioning William F. Buckley while under the watchful gaze of social revolutionaries. Today, murals are not in service of class revolution as much as a progressive conception of diversity that feels awkward being in the same room as Plato and Thomas Aquinas. Or Thomas Jefferson for that matter. To the extent that the universities’ commissioned artists might draw upon muralismo, diversity can’t even be properly served. The range of physical differences among races, such as they might be conceived, tend to be limited when manifested. Rather than people who look distinctly white, black, Asian, or whatever, everyone in these murals seems to have a tame variant of a mocha complexion. The format is not just ideologically rooted, it is ethnically rooted. To be clear, nothing is wrong with Mesoamerican culture and people themselves. Problems of a related sort would emerge if a student association chose to depict diversity through Chinese scroll paintings or any other single format with a strong cultural association. The next time some university entity contemplates public art for their campus community, they ought to look beyond the muralismo tradition. It seems newer state schools are generally bereft of a classic form of art: statues cast in metal. 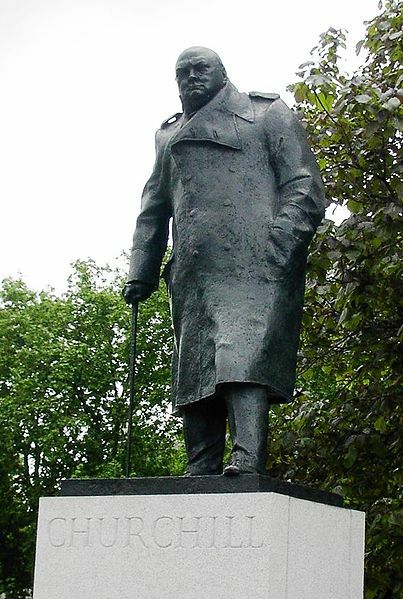 You know, like Lord Nelson at Trafalgar Square, or Winston Churchill near Westminster. Maybe they’re avoided because there have been too many dead white men honored by the medium. The pictures really support your points. I, honestly, think the statues are more awe-inspiring than the murals.